Betty and Don Goss traveled from Bloomington to the Woodstock Club at Indianapolis many times over the years for board and member meetings. They also worked at home to serve our Indiana Society. Betty was Historian until her illness. Don was on the Scholarship Committee and he was editor of the newsletter. You may recall seeing Don, with a smile, taking notes and interviewing people for the newsletter. No matter what was happening with Betty and Don, the newsletter was always accurate and on time. These are the major ways which they served our society. Both did countless small acts which enabled our society to function smoothly. 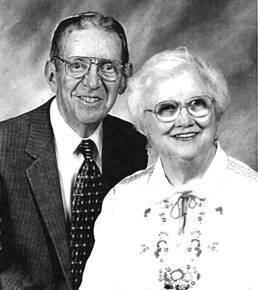 Don and Betty were devoted to each other. Don brought Betty to meetings as long as she was able to come, sometimes with the help of their daughter Cindy Goss Johnson. We knew that Betty and Don loved their family, were proud that two grandsons were scholarship recipients, were proud of their Mayflower ancestors, worked for our society, and that they cared greatly about our Indiana Society. Betty Jean Soule Goss passed away on September 19, 2005. Donald Carlton Goss passed away on December 23, 2005. The Indiana Society of Mayflower Descendants was surprised and touched to find that Betty and Don left six thousand dollars to our society. We are grateful for this gift which will be placed in the Scholarship Fund. The Indiana Society misses Betty and Don and will long remember their devotion to each other as well as to the Indiana society. Our condolences go to the Goss family. It was in 1982 that I first met Jo Taylor at a Mayflower meeting. It was my first meeting. In a roomful of strangers, she made me feel welcome. She seemed to be truly glad that I came. I later served on the Memorial Book Committee with Jo. She took our duties seriously. We carefully selected each book the Society donated to the Indiana State Library in memory of each deceased member. She made sure that the bookplate dedication was correct and that a note was written to the family advising of the donation. I know that Jo faithfully served the Indiana Society of Mayflower Descendants for many years, in many capacities - including Governor. Yet, I felt her interest was always with the Book Committee. When I succeeded Jo as chairman of the committee, we often talked of the Indiana State Library, of possible books to be donated, and of the members' lives the books were in memorial. She knew many. Somehow, I wasn't surprised to learn that Jo had left a generous bequest in her will to insure that the Indiana Society of Mayflower Descendants will be able to continue the memorial donation of books to the Library. Her faithful service and interest in our Society will be apparent with each book the committee purchases for many, many years to come. I believe that this was Jo's desire when she made the bequest in her will. I think it must have given her pleasure to know that the memorial books will continue to be donated. Some day, someone in the future may ask, "Who was the Jo Taylor who left funds to purchase these memorial books?" The answer should be, "She was a great lady who loved the Indiana Society of Mayflower Descendants and memorial books." I think Jo would be pleased with this answer. Jo Taylor passed away April 4, 1998, at the age of 93. She had been a member of the Mayflower Society for 40 years and served actively in its leadership for many years. She was a descendant of William Brewster.